In May this year, Google announced some major changes to Google Adword (and Analytics for that matter) at their annual Google Performance Summit. Now that the changes are here, and most Adwords accounts can manually toggle to the new dashboard, and new accounts set by default, there are some major changes that everyone with an Adwords account should know. Note: the old standard ad formats will be phased out on January 31, 2017. If you have a legacy account that you haven’t optimized in a while, or need a new strategy please reach out. And because marketers love acronyms, Expanded Text Ads are known as ETAs. This is one of the biggest changes since Adwords launched 15 years ago. ETAs alter the fundamentals of the Adwords ads. For Google’s explanation here’s their official support article/guide. Where the traditional ad was limited to three rows (Headline 25 characters, and 2 description lines at 35 characters each) with a 35 character display URL, the new ETAs have 2 headlines at 30 characters each, and a description that is 80 characters. This 47% more character space for advertisers to explain their products or services. These new ads are designed for the mobile first world, and as such are designed to maximize engagement and performance on mobile, with the bigger headline and expanded longer description. 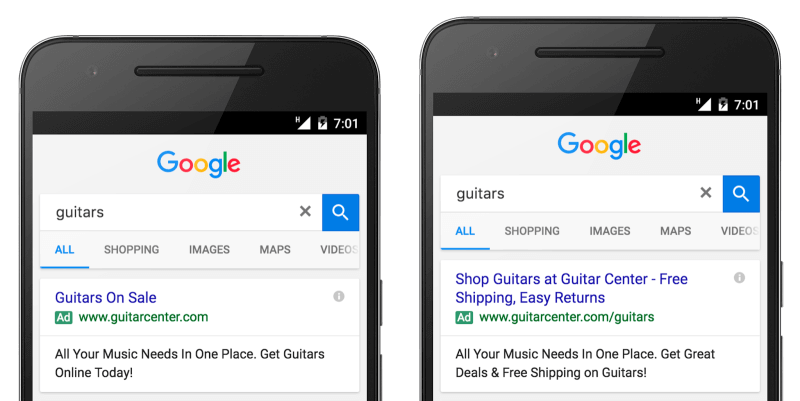 Note: even though these ads are likely designed for mobile, desktop search will also benefit greatly by allowing more information to be shown to your customers. This will likely help reduce “tire kickers” by providing them enough information on the front end to qualify your service/product and increase the number of quality clicks. While I don’t have a direct source at Google, multiple news outlets and bloggers are reporting that Google made this change after asking the internal question – What would Adwords look like if we built it today?” From there, they started to look at mobile interactions, their other changes in layout and design, as well as industry trends across the web. There’s also some thoughts about the 140 characters limit for an ad, not matching Twitters 140 character space. I wouldn’t put it past the two companies to be working on a partnership. Although I would be skeptical of my ads designed for search showing in a twitter feed. A theory of mine is rooted a little more in the business logic. It’s possible that Google is slowly looking to monetize the mobile users even more as the usage shift continues. By creating more relevant and engaging ads and getting more clicks, they can increase the revenue per mobile search, and also potentially add more ads (possibly get up to 6-8 ads on mobile). This would go a long way to increasing revenue of their flagship product. The mobile first strategy fits nicely with their earlier algorithm change that prioritizes mobile optimized website for mobile searches. How does this impact CTR and Quality Score? If you have an account, or you’ve ever been sold by a search marketer, you’ve heard Click Thru Rate (CTR) and Quality Score before. If you’re reading for the first time, CTR is a percentage of clicks divided by the number of times your ad was shown (the higher the better), and Quality Score (QS) is a composite number Google gives your keywords/ads that helps rank all advertisers in the auction. QS is a combination of many things, but your CTR and Overall Performance and Relevance are the main factors. So, back to the question. This change should be positive for both. CTR should rise across the board for updated ads that are done well. Taking advantage of the extra real estate should allow for more clarification, features/benefits explanations etc. Couple these new ETAs with call extensions or site extensions and your ads should see an increase in clicks. QS will become even more important. With more characters relevance continue to get a higher weight in the algorithm. Remember that Google is only a computer, and these calculations are being made with recognized patterns, and while AI is getting better it’s still a great idea to include the actual keywords in both the ads, and on the landing page to showcase the relevance of your site to the search. 1. Your Headlines are now the most important elements. And YES dynamic keyword insertion is still available with ETAs. 2. Headline 1 is more important than headline two. Think of these both as the 1-2 punch, and try to keep them telling the story of your ad, not two independent headlines. 3. Write the ads for all platforms, not just mobile. Stats show that 98% of users move between devices in the same day, often searching in both places before completing the goal/purchase. The new ads will be displayed across these devices, so your message should be written to be platform agnostic as well. 4. Update or Add your extensions. Some of the features that you’ve included in your old extensions are likely part of the main ad now. So, remove the redundant content, and highlight even more value with your ads. 5. If you’re sending paid traffic back to non-mobile friendly page/site, update your website immediately. Without a mobile friendly website, your QS will likely take an even bigger hit with ETAs. ETAs are not the only changes that Google has released. There are several other changes in the new Adwords interface, some small UI changes, and others cool like the visual data options. There are some very cool changes to device bidding, and their new responsive display ads are really cool. I expect that between now and over the first half of 2017 we’ll be treated to several updates, and small tweaks as Google looks to maximize the changes.